This slow cooker pot roast is made with only five ingredients plus water! It's an easy pot roast recipe with onion soup mix and veggies. [post_ads]This easy, popular slow cooker pot roast is made with only five ingredients plus the water, and two of the ingredients (vegetables) are optional! Use a good lean beef chuck roast in this recipe, or look for a cut of beef with "pot roast" on the label. Chuck roast, bottom round, and rump roast are best for long, slow braising. Beef brisket and short ribs are excellent choices as well. Onion soup flavors the beef perfectly. Doesn't hurt that it's an inexpensive and convenient way to flavor the meat. Just put everything in the crockpot, set it, and forget it! Place beef pot roast in the crock pot. Add carrots and new potatoes, if using. Combine the condensed soups, onion soup mix, and water; pour over the pot roast and vegetables, if using. Cook on low 8 to 10 hrs or until tender. Or cook on HIGH for about 3 to 4 hours. If desired, thicken the gravy with about 2 tablespoons of flour or cornstarch which has been mixed with cold water. 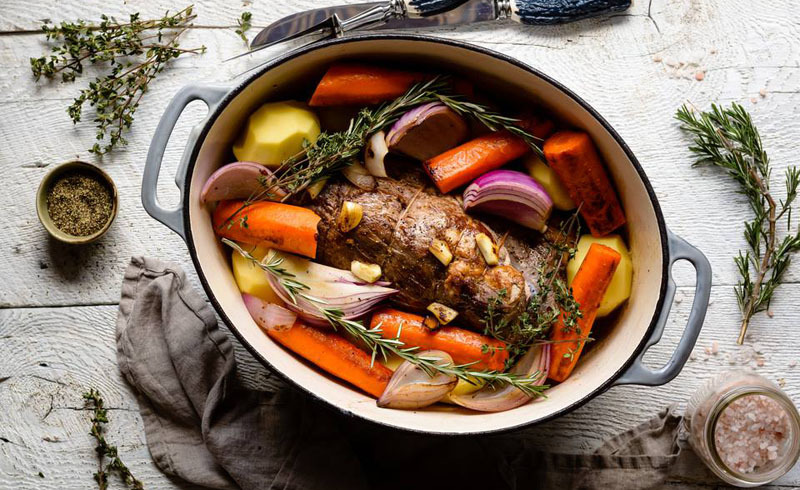 *Cuts of meat for pot roasts are often labeled by the grocer, but if not, choose a lean chuck roast, blade roast, 7-bone, rump roast, bottom round, or shoulder roast. Because of condensation, the juices are often watered down by the end of the cooking time. When the roast is done, keep it warm and pour juices into a medium saucepan. Bring the juices to a boil and simmer briskly for about 8 to 10 minutes, or until the volume has reduced and the flavors are concentrated. To thicken, combine 2 teaspoons of cornstarch or about 1 tablespoon of flour with a few tablespoons of cold water. Mix until smooth and stir into the simmering juices. Serve the sauce with the sliced pot roast.